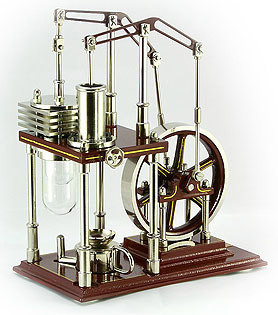 This balancing machine is an own construction and due to its design suitable for show-cases and as desk table model. 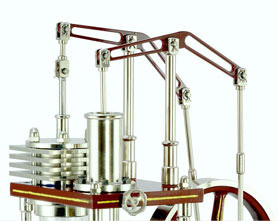 The pillars, levers and rods give the model a very pretentious design, which impressively is confirmed by its mechanic movement. Owing to the glass cylinder the operating procedure of the STIRLING can be observed very well. The number of revolutions per minute can be regulated. flying wheel D-90 mm, heating-/displacement glass-cylinder.